This week we have eight of the nine ships on the ocean, as the Buffalo makes ready to sail. We also have a rare insight into the thoughts and feelings of one of the ordinary emigrants who is traveling in steerage. Rosina Ferguson and her husband have left their native Scotland to travel to Portsmouth where they have boarded the Buffalo. Although a little annoyed that the ‘ladies and gentlemen’ travelling with them have been much slower to board, she is generally content, and is gratified that a woman in her ‘station in life’ has been shown ‘every kindness’. The berths sound very small and cramped to us now, only six feet by four, and separated by flimsy canvas sheeting. Rosina says they are like her ‘mother’s hens nests’, but she is grateful for her health and for her husband – ‘one of the kindest and best of husbands I could desire’. We can’t help but hope that all will go well for her on the voyage. It is a far cry from Rosina’s cramped quarters to those of cabin passengers like Robert Gouger, who is travelling on the Africaine. In his dairy this week he describes how they ‘fare sumptuously every day’ and goes on to detail what seems to be a quite extraordinary amount of food and drink consumed. We might wonder whether any of these ladies and gentlemen were actually sober by the late afternoon! Gouger’s diary also points to the differences between the standards of fare served to the different classes of passengers. While the cabin passengers eat fresh meat every day, those in Cabins of lesser comfort than those occupied by privileged passengers and intermediate between them and the dormitory accommodation afforded the emigrants. intermediate cabins only have fresh meat once per week. Gouger doesn’t bother to tell us what the emigrants in steerage are served, only that they ‘are all contented, and have reason to be.’ We shall find out whether they agree with him over the coming weeks and months! Meanwhile Captain Morgan is approaching the end of his journey, as he heads into the Great Australian Bight. He catches his first glimpse of Australia, but his pleasure is spoiled by wrangling and petty thefts between his passengers and crew. In despair Captain Morgan reflects that ‘such ignorence and vice I belive seldom ever met together’. … Our cabin party besides Capn & Mrs Duff, consists of ourselves, Mr, Mrs & Miss Brown, the Emigration agent, his wife and sister; Mr & Mrs Hallett, a merchant & purchaser of land who settles in the colony and who is in partnership with Duff; Mr Everard & his wife; and Mr Skipper, the son of a solicitor of Norwich who is articled to Mr Mann, the Attorney General of the colony. The first mate also dines in the cuddy; thus we have the unfortunate number of thirteen! We fare sumptuously every day – Hot rolls for breakfast manufactured by our excellent black steward, eggs, rice, two sorts of cold meat, coffee, & every tolerable tea. At twelve luncheon: bread & cheese, the last of two kinds, both good, with admirable bottled porter, Hodgson’s pale ale wine & spirits. We dine at four; soup of an excellent quality, two joints, and poultry. As a sample: today we had pea soup, salt fish & eggs, haunch of mutton, fowls and pork – occasionally plum pudding. Then beer, porter, wine and spirits as the French say à la volonté, which is being interpreted, as much as you please. Tea at eight, and the grog bottles from nine to ten. This precision on my part is for the especial consideration of Household [?]. It is true the ducks & geese are sometimes worthy the appellation of matrons, but certainly everything is better than I found it at Ibbotson’s Hotel. Harriet gives the soups unequivocal praise, and while I am writing she is having for luncheon a basin of chicken broth, which calls forth a laudation at every mouthful. The intermediate party (i.e. 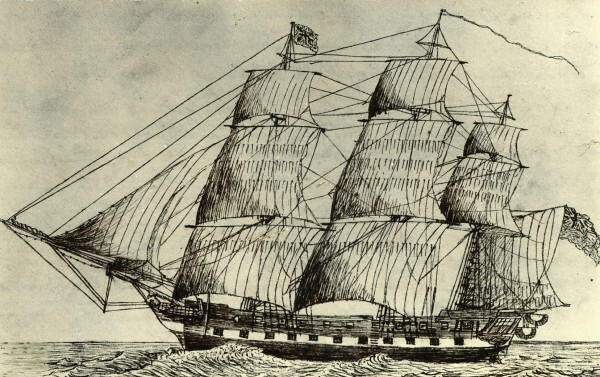 between the cabin and the steerage) consists of eighteen persons; one intends to keep an hotel in the colony, Mr Thomas and his family (he is the proprietor of the colonial newspaper), my clerk Mr Nantes, and four proprietors of land in South Australia. They fare differently to the cabin passengers, having fresh meat but once a week, and on other days salt fish, pork or beef. … I must however say at any risk that Capn Duff’s conduct in every respect merits the warmest encomiums; he appears to be a thorough sailor, decisive and skilful; he pays equal attention to all the passengers, has no favorites apparently, & therefore is a general favorite. hands of the cruel man..
Next week: Passengers on the Africaine are out of sorts – some ill, others discontented with their provisions. The Buffalo is delayed at St Helen’s, but the Duke of York is closing in on Kangaroo Island. HMS Buffalo, 1836. Image courtesy of State Library of South Australia, B 4263.